You’re reading the article. Ah, I should reword that. You’re reading THE article. This is the right article. You know it’s right because you’re nodding your head. Maybe even snapping your fingers or something like that. Your agreement with the article produces a degree of vehemence and fervour within that light you up. You feel like you’re reading the tears of Jesus, and they are giving you super powers that you will later on integrate into your life and use to take your leadership to the next quantum leap. But none of that is likely to come from this (or any other) article. It’s not that it’s a bad thing for an article to inspire head-nodding and agreement — it’s just that most of our time is spent seeking out agreement for our current worldview. This is your ego’s job — to filter the vast amount of information out there, disregard what you don’t agree with, and allow in everything that you do agree with. And the truth is that going along with our ego is not a bad thing, and in fact, feels good. It’s like going along with our grain. Not necessarily what’s authentic to our deepest self, but certainly what’s authentic to ourselves in the moment. Going for feeling good, isn’t objectively a bad thing — it’s just not a particularly powerful way to live your life. There’s a whole bunch of ways you can go about living your life. None of them is particularly better or worse, they just provide different results. Like every choice, they each bring their own set of consequences and benefits. 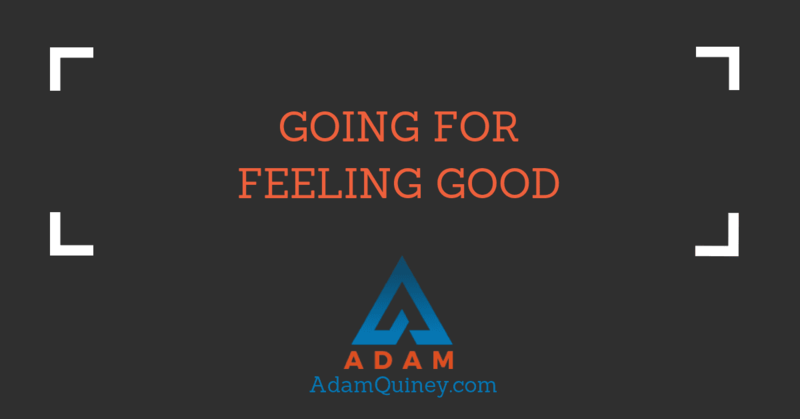 Going for feeling good means that you live your life based on how you feel, rather than what you’re committed to. Which is great when feeling good is aligned with your deeper commitment, but when your commitment and feeling good are out of alignment, it’s the commitment that suffers. Going for feeling good means that you tend not to expand very much, which a lot of people will have a reaction to. Your reaction I likely due to the fact that we tend to think expansion is better than contraction — but again, they’re just choices. You won’t tend to expand much because expansion doesn’t usually feel good in the moment. What feels good is safety and comfort. Stress and overwhelm don’t feel good, and because they are often driven up by leaving our comfort zone, a life where you go for feeling good means one where you avoid the things that exist outside of your comfort zone. You don’t need to take any of this on — there’s nothing wrong with going for feeling good. It just means that that’s the point at which your development as a leader stops. It’s the point at which you stop stretching out into life, and begin contracting from it. Where are you choosing from?